The craft of programming is almost universally concerned with different types of data and operations/algorithms that act on this data . Therefore, it's hardly surprising that designing abstractions for data types and operations has been on the mind of software engineers and programming-language designers since... forever. Yet I've only recently encountered a name for a software design problem which I ran into multiple times in my career. It's a problem so fundamental that I was quite surprised that I haven't seen it named before. Here is a quick problem statement. Imagine that we have a set of data types and a set of operations that act on these types. Sometimes we need to add more operations and make sure they work properly on all types; sometimes we need to add more types and make sure all operations work properly on them. Sometimes, however, we need to add both - and herein lies the problem. Most of the mainstream programming languages don't provide good tools to add both new types and new operations to an existing system without having to change existing code. This is called the "expression problem". Studying the problem and its possible solutions gives great insight into the fundamental differences between object-oriented and functional programming and well as concepts like interfaces and multiple dispatch. As is my wont, my example comes from the world of compilers and interpreters. To my defense, this is also the example used in some of the seminal historic sources on the expression problem, as the historical perspective section below details. Until now, it's all fairly basic stuff. How extensible is this design? Let's see... if we want to add new expression types ("variable reference", "function call" etc. ), that's pretty easy. We just define additional classes inheriting from Expr and implement the Expr interface (ToString and Eval). However, what happens if we want to add new operations that can be applied to expression trees? Right now we have Eval and ToString, but we may want additional operations like "type check" or "serialize" or "compile to machine code" or whatever. It turns out that adding new operations isn't as easy as adding new types. We'd have to change the Expr interface, and consequently change every existing expression type to support the new method(s). If we don't control the original code or it's hard to change it for other reasons, we're in trouble. The problem we're hitting here is called the expression problem, and the example above shows how it applies to object-oriented programming. Interestingly, the expression problem bites functional programming languages as well. Let's see how. Update 2018-02-05: a new post discusses the problem and its solutions in Haskell in more depth. Object-oriented approaches tend to collect functionality in objects (types). Functional languages cut the cake from a different angle, usually preferring types as thin data containers, collecting most functionality in functions (operations) that act upon them. Functional languages don't escape the expression problem - it just manifests there in a different way. Now let's say we want to add a new operation - type checking. We simply have to add a new function typecheck and define how it behaves for all known kinds of expressions. No need to modify existing code. On the other hand, if we want to add a new type (like "function call"), we get into trouble. We now have to modify all existing functions to handle this new type. So we hit exactly the same problem, albeit from a different angle. A visual representation of the expression problem can be helpful to appreciate how it applies to OOP and FP in different ways, and how a potential solution would look. The expression problem isn't new, and has likely been with us since the early days; it pops its head as soon as programs reach some not-too-high level of complexity. It's fairly certain that the name expression problem comes from an email sent by Philip Wadler to a mailing list deailing with adding generics to Java (this was back in the 1990s). In that email, Wadler points to the paper "Synthesizing Object-Oriented and Functional Design to Promote Re-Use" by Krishnamurthi, Felleisen and Friedman as an earlier work describing the problem and proposed solutions. This is a great paper and I highly recommend reading it. Krishnamurthi et.al., in their references, point to papers from as early as 1975 describing variations of the problem in Algol. So far the article has focused on the expression problem, and I hope it's clear by now. However, the title also has the word solution in it, so let's turn to that. It's possible to kinda solve (read on to understand why I say "kinda") the expression problem in object-oriented languages; first, we have to look at how we can flip the problem on its side using the visitor pattern. The visitor pattern is very common for this kind of problems, and for a good reason. It lets us reformulate our code in a way that makes it easier to change in some dimensions (though harder in others). It should be obvious that for a given set of data types, adding new visitors is easy and doesn't require modifying any other code. On the other hand, adding new types is problematic since it means we have to update the ExprVisitor interface with a new abstract method, and consequently update all the visitors to implement it. So it seems that we've just turned the expression problem on its side: we're using an OOP language, but now it's hard to add types and easy to add ops, just like in the functional approach. I find it extremely interesting that we can do this. In my eyes this highlights the power of different abstractions and paradigms, and how they enable us to rethink a problem in a completely different light. So we haven't solved anything yet; we've just changed the nature of the problem we're facing. Worry not - this is just a stepping stone to an actual solution. The following is code excerpts from a C++ solution that follows the extended visitor pattern proposed by Krishnamurthi et. al. in their paper; I strongly suggest reading the paper (particularly section 3) if you want to understand this code on a deep level. A complete code sample in C++ that compiles and runs is available here. Adding new visitors (ops) with the visitor pattern is easy. Our challenge is to add a new type without upheaving too much existing code. Let's see how it's done. // This is the new ("extended") expression we're adding. But in C++ virtual multiple inheritance is the tool we have. The virtual part of the inheritance is essential here for the compiler to figure out that the ExprVisitor base underlying both Evaluator and ExprVisitorWithFunctionCall is the same and should only appear once in EvaluatorWithFunctionCall. Without virtual, the compiler would complain that EvaluatorWithFunctionCall doesn't implement the ExprVisitor interface. This is a solution, alright. We kinda added a new type FunctionCall and can now visit it without changing existing code (assuming the virtual inheritance was built into the design from the start to anticipate this approach). Here I am using this "kinda" word again... it's time to explain why. Note the dynamic_cast in FunctionCall::Accept. It's fairly ugly that we're forced to mix in dynamic checks into this code, which should supposedly rely on static typing and the compiler. But it's just a sign of a larger problem. If we have an instance of an Evaluator, it will no longer work on the whole extended expression tree since it has no understanding of FunctionCall. It's easy to say that all new evaluators should rather be EvaluatorWithFunctionCall, but we don't always control this. What about code that was already written? What about Evaluators created in third-party or library code which we have no control of? Finally, the solution is unwieldy for realistic applications. Adding one new type looks manageable; what about adding 15 new types, gradually over time? Imagine the horrible zoo of ExprVisitor extensions and dynamic checks this would lead to. Yeah, programming is hard. I could go on and on about the limitations of classical OOP and how they surface in this example . Instead, I'll just present how the expression problem can be solved in a language that supports multiple dispatch and separates the defintion of methods from the bodies of types they act upon. 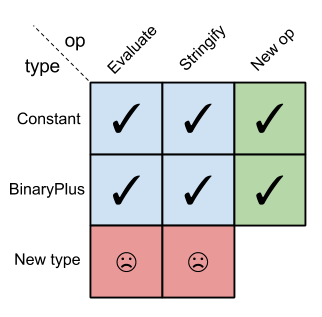 There are a number of ways the expression problem as displayed in this article can be solved in Clojure using the language's built-in features. Let's start with the simplest one - multi-methods. We can add new ops without touching any existing code. We can also add new types without touching any existing code. The code we're adding is only the new code to handle the ops/types in question. The existing ops and types could come from a third-party library to which we don't have source access. We could still extend them for our new ops and types, without ever having to touch (or even see) the original source code . Is multiple dispatch necessary to cleanly solve the expression problem? I've written about multiple dispatch in Clojure before, and in the previous section we see another example of how to use the language's defmulti/defmethod constructs. But is it multiple dispatch at all? No! It's just single dispatch, really. Our ops (evaluate and stringify) dispatch on a single argument - the expression type) . If we're not really using multiple dispatch, what is the secret sauce that lets us solve the expression problem so elegantly in Clojure? The answer is - open methods. Note a crucial difference between how methods are defined in C++/Java and in Clojure. In C++/Java, methods have to be part of a class and defined (or at least declared) in its body. You cannot add a method to a class without changing the class's source code. In Clojure, you can. In fact, since data types and multimethods are orthogonal entities, this is by design. Methods simply live outside types - they are first class citizens, rather than properties of types. We don't add methods to a type, we add new methods that act upon the type. This doesn't require modifying the type's code in any way (or even having access to its code). Clojure's multimethods are very general and powerful. So general, in fact, that their performance may not be optimal for the most common case - which is single dispatch based on the type of the sole method argument; note that this is exactly the kind of dispatch I'm using in this article. Therefore, starting with Clojure 1.2, user code gained the ability to define and use protocols - a language feature that was previously restricted only to built-in types. Clojure protocols are an interesting topic, and while I'd like to spend some more time on them, this article is becoming too long as it is. So I'll leave a more thorough treatment for some later time and for now will just show how protocols can also be used to solve the expression problem we're discussing. However, instead of defining a multimethod for each operation, we now define a protocol. 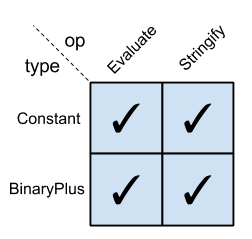 A protocol can be thought of as an interface in a language like Java, C++ or Go - a type implements an interface when it defines the set of methods declared by the interface. In this respect, Clojure's protocols are more like Go's interfaces than Java's, as we don't have to say a-priori which interfaces a type implements when we define it. The extend-type macro is a convenience wrapper around the more general extend - it lets us implement multiple protocols for a given type. A sibling macro named extend-protocol lets us implement the same protocol for multiple types in the same invocation . This time, extending a single protocol for multiple data types - extend-protocol is the more convenient macro to use. You may have noted that the protocols (interfaces) defined in the Clojure solution are very small - consisting of a single method. Since adding methods to an existing protocol is much more problematic (I'm not aware of a way to do this in Clojure), keeping protocols small is a good idea. This guideline comes up in other contexts as well; for example, it's good practice to keep interfaces in Go very minimal. In our C++ solution, splitting the Expr interface could also be a good idea, but it wouldn't help us with the expression problem, since we can't modify which interfaces a class implements after we've defined it; in Clojure we can. "Types of data" and "operations" are two terms that should be fairly obvious to modern-day programmers. Philip Wadler, in his discussion of the expression problem (see the "historical perspective" section of the article) calls them "datatypes" and "functions". A famous quote from Fred Brooks's The Mythical Man Month (1975) is "Show me your flowcharts and conceal your tables, and I shall continue to be mystified. Show me your tables, and I won’t usually need your flowcharts; they’ll be obvious." Note the peculiar way in which data is passed between Visit* methods in a Expr* -> Value map kept in the visitor. This is due to our inability to make Visit* methods return different types in different visitors. For example, in Evaluator we'd want them to return double, but in Stringifier they'd probably return std::string. Unfortunately C++ won't let us easily mix templates and virtual functions, so we have to resort to either returning void* the C way or the method I'm using here. Curiously, in their paper Krishnamurthi et.al. run into the same issue in the dialect of Java they're using, and propose some language extensions to solve it. Philip Wadler uses proposed Java generics in his approach. I can't resist, so just in brief: IMHO inheritance is only good for a very narrow spectrum of uses, but languages like C++ hail it as the main extension mechanism of types. But inheritance is deeply flawed for many other use cases, such as implementations of interfaces. Java is a bit better in this regard, but in the end the primacy of classes and their "closed-ness" make a lot of tasks - like the expression problem - very difficult to express in a clean way. In fact, there are plenty of examples in which the Clojure implementation and the standard library provide protocols that can be extended by the user for user-defined types. Extending user-written protocols and multimethods for built-in types is trivial. As an exercise, add an evaluate implementation for java.lang.Long, so that built-in integers could participate in our expression trees without requiring wrapping in a Constant. FWIW, we can formulate a multiple dispatch solution to the expression problem in Clojure. The key idea is to dispatch on two things: type and operation. Just for fun, I coded a prototype that does this which you can see here. I think the approach presented in the article - each operation being its own multimethod - is preferable, though. The sharp-eyed reader will notice a cool connection to the expression problem matrix. extend-type can add a whole new row to the matrix, while extend-protocol adds a column. extend adds just a single cell.